All transactions are safe and secure with a reliable history in online purchasing behind each of our associates. 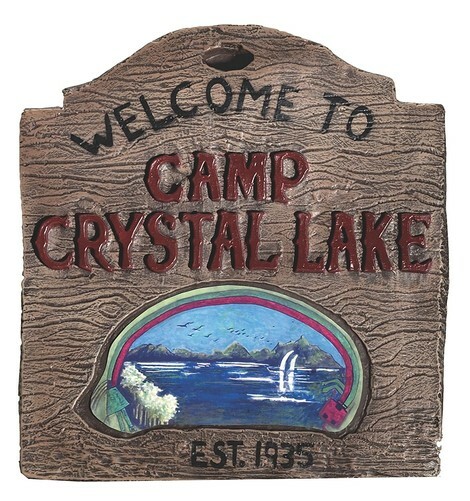 Buy the Camp Crystal Lake Sign to own Friday the 13th clothing and merchandise. Turn your front yard into the Crystal Lake Campground with a prop sign. The faux wooden decoration features raised letters and is made from molded plastic. A simple and affordable option, this Camp Crystal Lake Halloween sign serves its purpose, despite it not being as authentic in terms of quality as some fans may desire. In addition to the Camp Crystal Lake Sign above, browse the Friday the 13th Clothing Gallery for more apparel like men's and women's clothes, kids shirts or hoodies.